What happens when you combine the pure tones of an internationally renowned mezzo soprano and the complex technology of a $15million quantum supercomputer? The answer will be exclusively revealed to audiences at the Port Eliot Festival when Superposition, created by Plymouth University composer Alexis Kirke, receives its world premiere later this summer. Combining the arts and sciences, as Dr Kirke has done with many of his previous works, the 15-minute piece will begin dark and mysterious with celebrated performer Juliette Pochin singing a low-pitched slow theme. But gradually the quiet sounds of electronic ambience will emerge over or beneath her voice, as the sounds of her singing are picked up by a microphone and sent over the internet to the D-Wave quantum computer at the University of Southern California. It then reacts with behaviours in the quantum realm that are turned into sounds back in the performance venue, the Round Room at Port Eliot, creating a unique and ground-breaking duet. And when the singer ends, the quantum processes are left to slowly fade away naturally, making their final sounds as the lights go to black. Plymouth University is the official Creative and Cultural Partner of the Port Eliot Festival, taking place in South East Cornwall from July 28 to 31, 2016. And Superposition will be one of a number of showcases of University talent and expertise as part of the first Port Eliot Science Lab. Being staged in the Round Room at Port Eliot, it will give festival goers the chance to explore science, see performances and take part in a range of experiments. The three-part performance will tell the story of Niobe, one of the more tragic figures in Greek mythology, but in this case a nod to the fact the heart of the quantum computer contains the metal named after her, niobium. It will also feature a monologue from Hamlet, interspersed with terms from quantum computing. This is the latest of Dr Kirke’s pioneering performance works, with previous productions including an opera based on the financial crisis and a piece using a cutting edge wave-testing facility as an instrument of percussion. 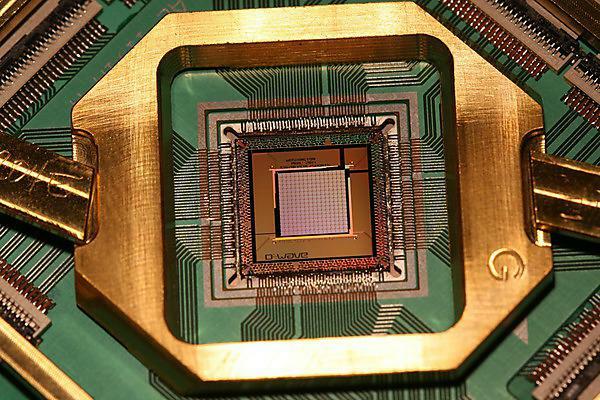 “This is an exciting time to be in the field of quantum computing. This is a field that was purely theoretical until the 1990s and now is making huge leaps forward every year. We have been researching the D-Wave machines for four years now, and have recently upgraded to the D-Wave 2X – the world’s most advanced commercially available quantum optimisation processor. We were very happy to welcome Dr Kirke on a short training residence here at the University of Southern California recently; and are excited to be collaborating with him on this performance, which we see as a great opportunity for education and public awareness."